Nighthawks is a painting by Edward Hopper that was completed in 1942. Editorial credit: Joseph Sohm / Shutterstock.com. Hopper was inspired by New York diners at night for his masterpiece, "Nighthawks". Nighthawks is noted as Edward Hopper's most renowned work as well as being an important painting of American art. The art piece features three customers gathered in a diner, each of one appears to be engaged in their thoughts. Once it was finished, Nighthawks became an instant classic, and it attracted the attention of Daniel Rich who was the director of the Art Institute of Chicago. Edward Hopper was an American born on July 22, 1882, in New York. At five years of age, Hopper exhibited skills in drawing and was encouraged by his parents. He experimented with oil, charcoal, pen and ink, and watercolor as a teenager and produced his initial signed oil painting in 1895. He received art education at the New York School of Art and Design where he specialized in oil painting. Hopper initially faced challenges in defining his individual style. The first sale of Hopper's painting took place at the Armory Show in 1913, and he managed to gain a level of recognition with his numerous etchings. Hopper's career took off in the early 1920s, a period during which he married Josephine Nivison who managed his career. Six of his Gloucester watercolors were accepted for an exhibit by the Brooklyn Museum, and The Mansard was subsequently bought by the Museum. Hopper's works primarily depicted urban as well as rural scenes using American realism style. Hopper did the finishing touches on the painting on January 21, 1942, and he intended to name it Night Hawks. He admitted the painting drew inspiration from a restaurant situated on Greenwich Avenue in New York where two streets converge. He further added that he drew the restaurant bigger and also simplified the scene. At the time Hopper was painting the art piece, fluorescent lights were a new development in America. The diner in the painting is bathed in an eerie glow, and it is clear that it is lit from more than one angle. Significant amounts of light spills onto the sidewalk. The diner's windows were painted in a seamless glass, and there is no depiction of an entrance. Hopper placed the art piece at Rehn's gallery where his paintings were usually placed for purchase. Daniel Rich, who was then serving as the director of the Art Institute of Chicago, went to the gallery to view Nighthawks upon recommendation by Josephine Nivison and on viewing it proclaimed the piece ‘fine as a Homer.' Rich made arrangements for its purchase by the Museum at a price of $3,000. The painting is currently among the Museum's collection. Nighthawks is recognized as one of the most popular artworks of the 20th century. The painting's diner scene has been emulated widely. Some of the Photorealists who emerged in the late 1960s, as well as the early 1970s, drew inspiration from Nighthawks. Ralph Goings for example modeled a few of his diner paintings after Nighthawks. Gottfried Helnwein in a 1984 painting replaced the restaurant figures with Marilyn Monroe, Humphrey Bogart, Elvis Presley, and James Dean, all pop culture icons in America. 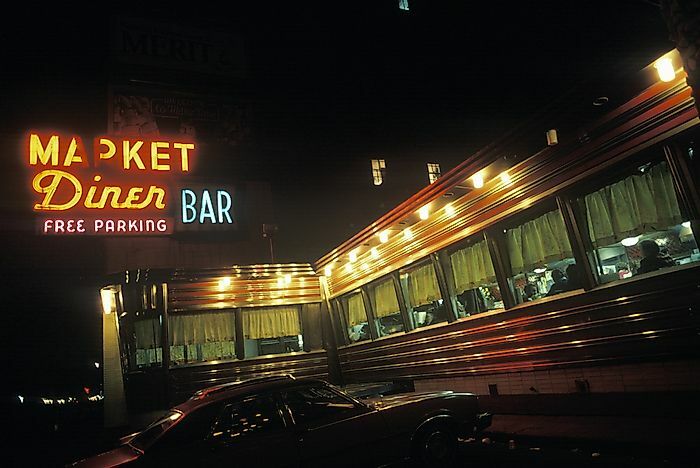 A couple of writers have explored various scenarios in an attempt to explain how the diner customers congregated together that night or even the events which followed such as the poem by Wolf Wondratschek named "Nighthawks: After Edward Hopper's Painting." The painting has also been referenced in film, television, music, and opera.